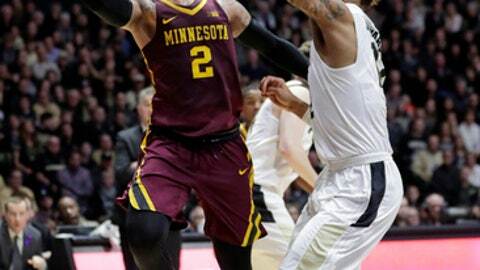 MINNEAPOLIS (AP) Nate Mason has finished his career with a flourish in his fourth year as the point guard for Minnesota, rising in the program’s record books with the performance of a calm, clutch and confident senior leader. This once-promising season took a sharp turn for the worse two months ago, when off-the-court trouble for center Reggie Lynch and a shoulder injury to small forward Amir Coffey took two starters off the court and sent the team into a tailspin it hasn’t recovered from. Not that Mason hasn’t tried to steer them out of it. The Gophers (15-16, 4-14) are the 11th seed for the Big Ten Tournament in New York, where they’ll face 14th seeded Rutgers (13-18, 3-15) on Wednesday night. They’ll have to win five times in five days for the improbable, to put it politely, automatic bid to the NCAA Tournament after losing 13 of their last 15 games. The week after Thanksgiving, the Gophers were ranked 12th nationally in the Associated Press poll. That sure resonated with his unexpectedly discouraging situation, watching his college eligibility whittled away this winter. McBrayer, a junior, has found himself in a wistful mood recently. Junior power forward Jordan Murphy called Mason the best leader he’s had in his three years with the program. The 6-foot-2 native of Decatur, Georgia, has nine 20-point performances this season, averaging 16.8 points and 3.7 rebounds per game, both career bests. He’s also shooting 39.5 percent from 3-point range, the highest of his career. Mason recently moved into fifth, past Sam Jacobson and Kevin McHale, on the program’s all-time scoring list with 1,719 points. If the Gophers win a game or two this week and Mason’s shot is sharp, he could finish even higher. Randy Breuer (third place, 1,777 points) and Andre Hollins (fourth place, 1,765 points) are within reach. Mason will also finish third in in program history in 3-pointers and second in assists. He’s seventh in steals, one behind Trent Tucker. He has also been playing through sore hips that have hampered him recently.